Tuesday & Wednesday 10:00 a.m. – 6:00 p.m.
Thursday & Friday 10:00 a.m. – 8:00 p.m.
Saturday & Sunday 10:00 a.m. – 6:00 p.m. 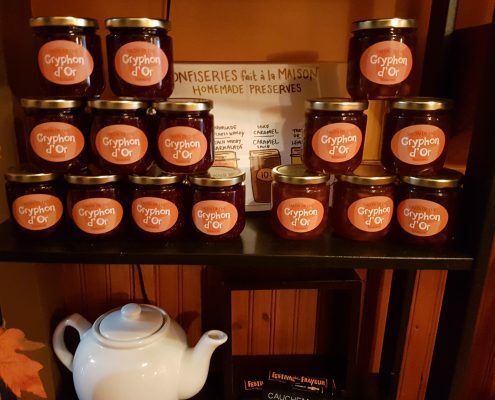 The Gryphon d’Or Tearoom has been and continues to be a friendly, welcoming place in the heart of the NDG community since 2003. 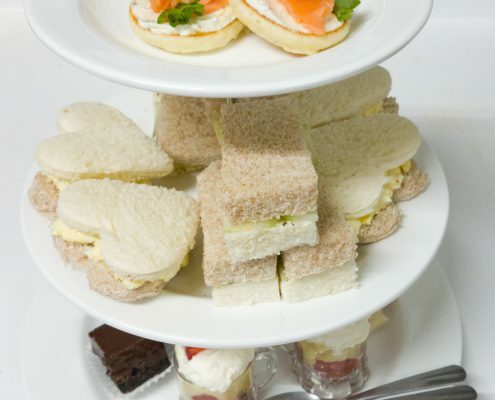 We offer a satisfying variety of delicious food that include our Gryphon d’Or Afternoon Tea, brunches, meals, soups, desserts and, of course, scrumptious scones. 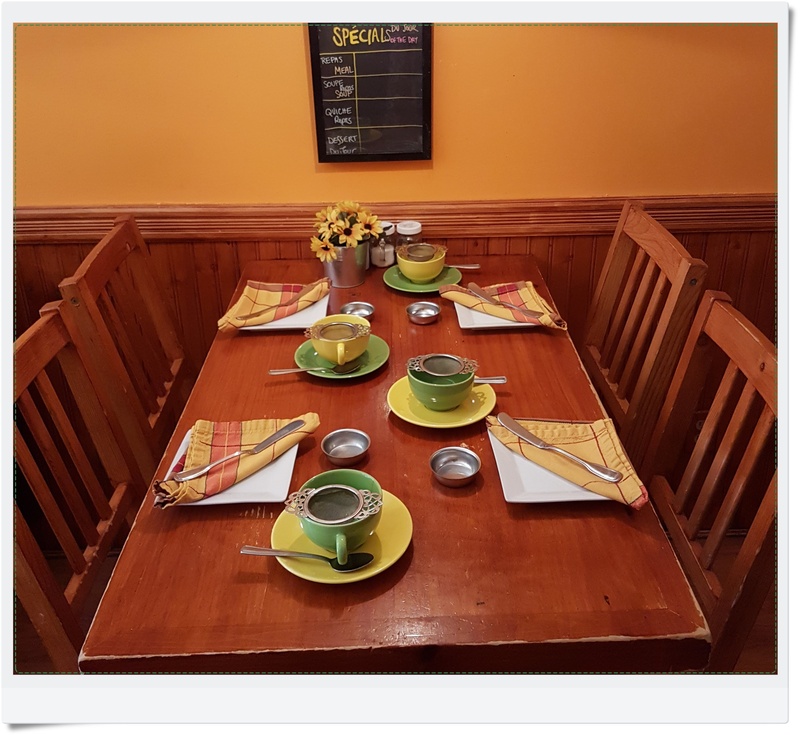 Whether it be a meal, tea or dessert our place is here for you to enjoy and feel warm and content. Everything we have to offer at one glance. All made fresh on the premises! 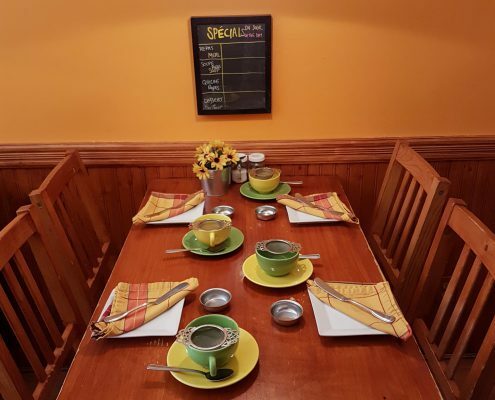 All our Gryphon Brunch meals are served with fresh fruit, green house salad, caramelized onion potatoes, and tea or coffee (self-serve bottomless cup) or a pot of BEEZ Teas (+$3.00). 2 eggs your way served with bacon or grilled beef salami and/or roasted veggies and a warm, fresh scone with butter, raspberry jam and sweet cream, and apple crisp. Egg, melted Cheddar, bacon or grilled beef salami and caramelized onion potatoes layered inside challah French toast. Egg, melted cheese (Cheddar, Swiss or goat cheese), bacon or grilled beef salami and/or roasted veggies, lettuce and tomato on freshly baked giant scone – served with spicy mayo on the side, and apple crisp. 3 egg omelette with cheese (Cheddar, Swiss or goat cheese), served with bacon or grilled beef salami and/or roasted veggies and a warm, fresh scone with butter, raspberry jam and sweet cream, and apple crisp. 2 poached eggs on freshly baked giant scone with bacon or grilled beef salami and/or roasted veggies, smothered with Welsh Rarebit sauce (made with Cheddar and dark ale). Tender, slowly cooked chicken with peas, carrots and potatoes – in a creamy béchamel sauce. 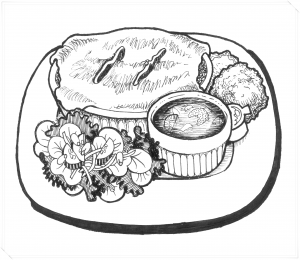 Creamy vegetable filling with Swiss chess – baked in a flakey Gryphon Bakery pie crust. Featuring a different classic every week! 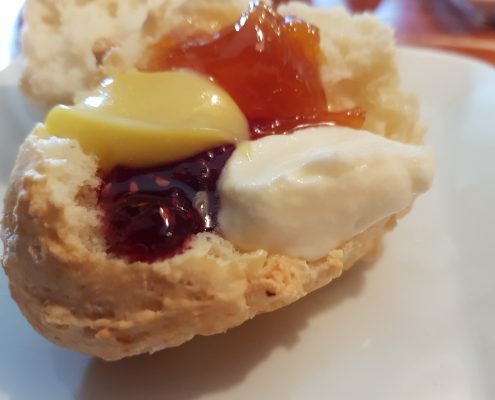 Freshly Baked Scone/s served with butter, sweet cream and raspberry jam, plus your choice of tangy lemon curd, dark caramel sauce or peach whiskey marmalade – all made on the premises! 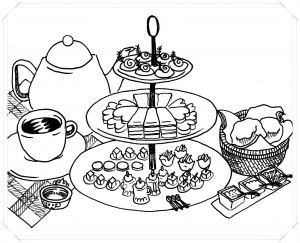 We’ll bring our tea sampler to your table for you to explore! 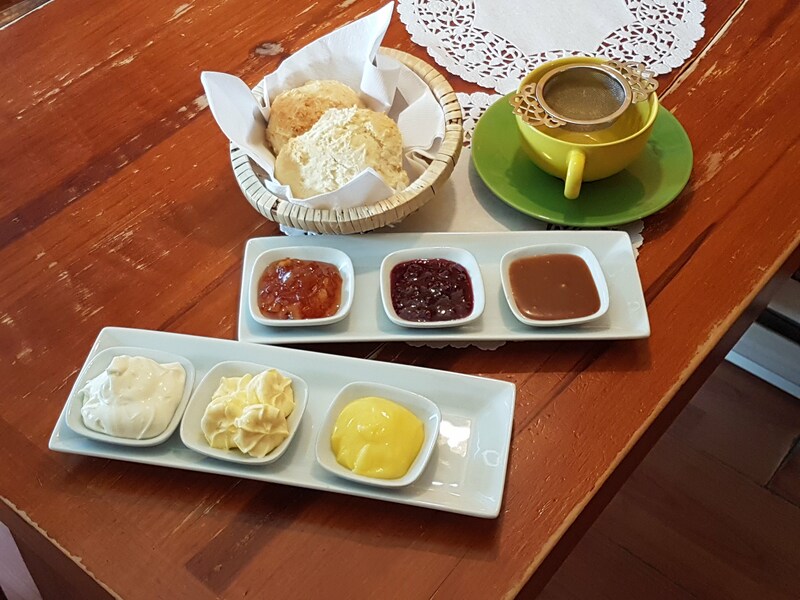 Served daily from 3:00 p.m.
served warm with butter, sweet cream, tangy lemon curd, raspberry jam, peach whiskey marmalade and dark caramel sauce – all made on the premises! Choose from our wide selection of in-house blended teas. 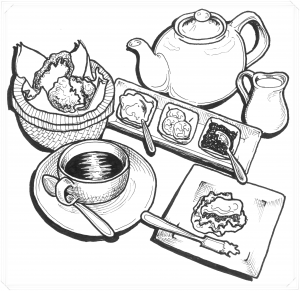 We’ll bring our tea sampler to our table for you to explore! 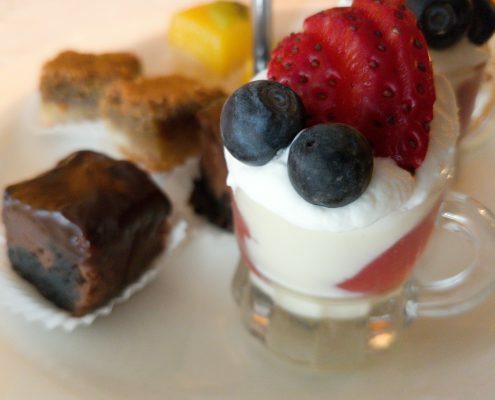 Enjoy our famous Afternoon Tea format for dessert! served warm with butter, sweet cream, tangy lemon curd, raspberry jam, peach whiskey marmalade and dark caramel sauce – all made on the premise! 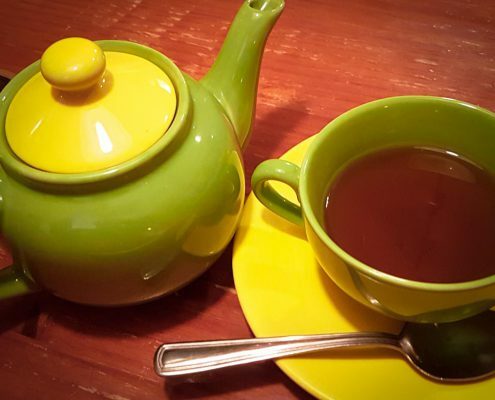 Choose from our wide selection of in-house blended teas. We’ll bring our tea sampler to your table for you to explore! We’ll bring our tea sampler to your table to explore! Tuesday & Wednesday 10:00 a.m.- 6:00 p.m.